Indigenous GLBT people from across North America and Hawaii converged on Sandstone, Minnesota, from August 28 to September 1 to celebrate two decades of success. 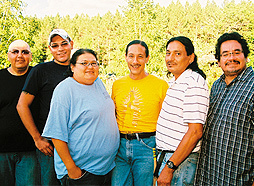 GLBT Native community representatives have been hosting this gathering in various locations throughout North America since 1988. It has reached more than 3,000 people. As an alcohol- and chemical-free event, it focuses on healing, ceremony, cultural revitalization, and social strengthening. Some of the highlights this year were a letter from Minneapolis Mayor R.T. Rybak; an invitation from both chambers of the Minnesota Legislature for Native participants to call upon the state for any assistance needed during their stay; and a letter from Democratic presidential nominee Barack Obama. The organizing committee tried reaching out to John McCain, but did not receive a response. Two-Spirits, a film about a 16-year-old transgender Navajo student in Colorado brutally murdered in 2001, was screened. Next year’s gathering is scheduled for Denver, followed by Winnipeg, Manitoba; Hawaii; and Edmonton, Alberta. In an attempt to increase inclusion on college campuses nationwide, Lambda 10 Project, with the help of Campus Pride, is hosting the first-ever OUT & GREEK November 14-16 at DePaul University in Chicago. The leadership conference is designed to show that the GLBT community is just as much a part of the Greek system as everything else on campus is. As part of the conference, people will be sharing stories about coming out while being Greek, as well as networking with other GLBT and allied fraternity and sorority leaders from around the country. Overall, conference organizers hope that everyone will learn strategies for their community, plus how to be safer and more GLBT-friendly. Lambda 10 Project, founded in 1995, works to heighten the visibility of GLBT members of the college fraternity and sorority system by serving as a clearinghouse for education resources related to sexual orientation and gender identity/expression. For more information, visit www.lambda10.org/outandgreek. Tony Kushner, the Pulitzer Prize-winning playwright best-known for Angels in America, is the first recipient of the Steinberg Distinguished Playwright Award. The $200,000 cash prize award is the largest for theater in the nation. Kushner said in The New York Times that the prize would “buy me time to work on plays,” which he hopes to do after finishing two current movie projects that include a screenplay about Abraham Lincoln for Steven Spielberg. In spring 2009, Kushner will premiere a new play, The Intelligent Homosexual’s Guide to Capitalism and Socialism With a Key to the Scripture, at the Guthrie proscenium stage. The same Guthrie season features his Tony-winning musical Caroline, or Change, as well as smaller Kushner works in its Dowling studio theater.